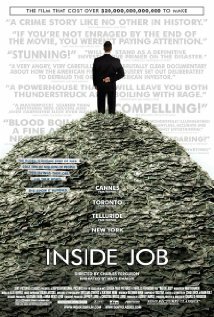 Inside Job (2010) is a documentary film about the late-2000s financial crisis directed by Charles H. Ferguson. The film was screened at the Cannes Film Festival in May 2010 and won the 2010 Academy Award for Best Documentary Feature. "This film portrayed a horrific set of circumstances in a measured and brilliantly illustrated manner. The economic issues were explained by clear, understandable graphs. Many major players appeared on camera to their detriment. The few that didn't appear were shown through press clips.